Preparing university exams or competitive examinations is a hard task that requires tenacity and hours of dedication. To accomplish your objectives as soon as possible, it is convenient to make the most of any educational resource that we have available. Thus, one of the most used is to complete tests or question papers. 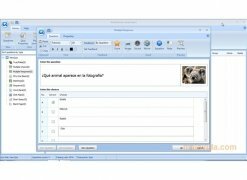 QuizCreator is an original useful application that makes it possible to generate your own question papers. With this in mind, it has quite a few templates to choose from. - Creation of customized question papers, about any theme of our choice. - Easily edit the questions that have been generated. - Publish the question papers that have been generated, to share them with other users. It's possible to create a questionnaire from the questions stored in an Excel file or from scratch. But QuizCreator not only is a brilliant application to complement your study techniques, it will also be ideal to create entertaining question and answer games, imitating Trivial, that will allow us to spend hours of entertainment.